Also serving communities of Loxahatchee. There are 31 Assisted Living Facilities in the Wellington area, with 8 in Wellington and 23 nearby. The average cost of assisted living in Wellington is $3,959 per month. This is higher than the national median of $3,346. Cheaper nearby regions include Royal Palm Beach with an average starting cost of $3,037. To help you with your search, browse the 103 reviews below for assisted living facilities in Wellington. On average, consumers rate assisted living in Wellington 4.8 out of 5 stars. Better rated regions include Parkland with an average rating of 4.9 out of 5 stars. Caring.com has helped thousands of families find high-quality senior care. To speak with one of our Family Advisors about assisted living options and costs in Wellington, call (855) 863-8283. Wellington is situated in southern Florida and is nestled just off the coast of West Palm Beach. This city was named one Money Magazine's Best Places to Live because of its low crime rates and luxurious atmosphere, both of which could be appealing to seniors seeking to settle in an affluent area. Assisted living facilities (ALFs) in Wellington are regulated by the Department of Elder Affairs. Seniors in this community have 60 ALFs in the Wellington area to choose from, with seven directly within the city limits and 53 in the surrounding regions. The Bureau of Health Facility Regulation oversees licensing the four types of ALFs in Wellington. During any month of the year, Wellington weather can reach temperatures in the mid-80s. Half of the summer days reach the 90s and with no snow in the winters, this climate is exceptionally warm and predictable. Seniors looking to escape cold weather could consider Wellington for assisted living. Wellington is an exceptionally safe area in Florida, with a violent crime rating of 18.3 as opposed to the national average of 31.1. Because violent crime rates in Wellington are much lower than the mean rate across the country, seniors could feel safer when traveling alone in this area. The West Palm Beach area, where Wellington is located, has multiple activities for seniors to enjoy, such as free movie nights, musical performances at the Wellington Amphitheater and two regional malls for shopping. The Wellington area is home to world-class medical facilities, including Wellington Regional Medical Center and Palms West Hospital, in the event of medical emergencies or illness. The air quality in Wellington is much better than the national average with a ranking of 73 in contrast with the national average score of 58. Air quality is determined by whether or not there are harmful air pollutants in the atmosphere, and Wellington's better air quality means seniors can spend more time out of out-of-doors with less damage to their respiratory systems. Living in Florida also means a tax cut for seniors. Florida excludes Social Security income and pension income from taxation, meaning more money can be spent on assisted living costs. Assisted Living costs in Wellington start around $3,959 per month on average, while the nationwide average cost of assisted living is $4,000 per month, according to the latest figures from Genworth’s Cost of Care Survey. It’s important to note that assisted living rates in Wellington and the surrounding suburbs can vary widely based on factors such as location, the level of care needed, apartment size and the types of amenities offered at each community. 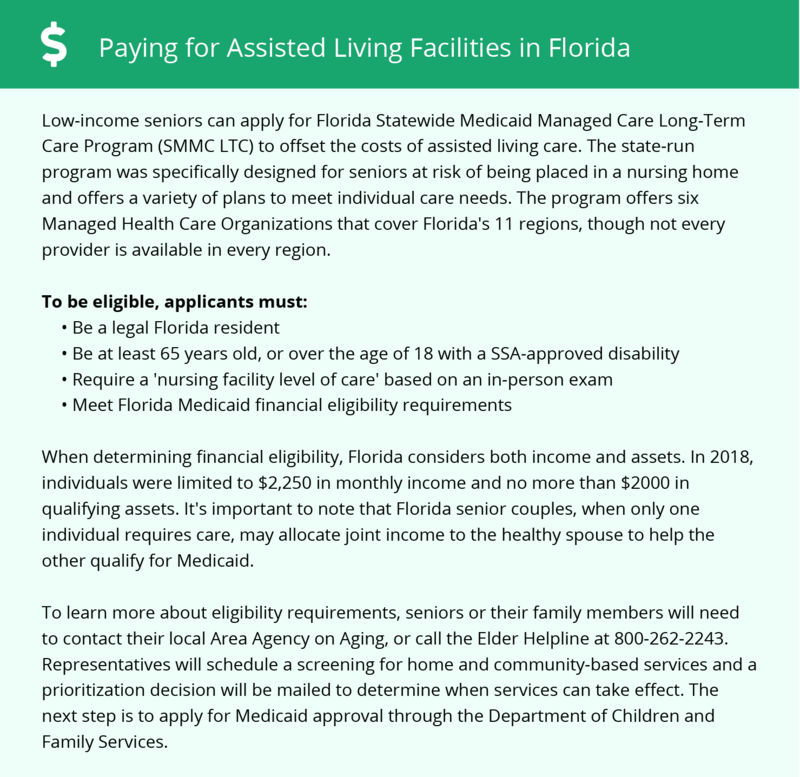 In the Wellington area and across Florida, eligible seniors can receive financial assistance from the Florida Statewide Medicaid Managed Care Long-Term Care Program (SMMC LTC). Florida also covers services in ALFs with a standard or specialty license under a statewide Medicaid 1915(b)(c) MLTC program. To see a list of free assisted living resources in Wellington, please visit our Assisted Living in Florida page. Wellington-area assisted living communities must adhere to the comprehensive set of state laws and regulations that all assisted living communities in Florida are required to follow. Visit our Assisted Living in Florida page for more information about these laws.